The German Shepherd Dog is a very popular breed of dog in the United States. It’s been in the top 3 most popular dog breeds for the last 10 years according to the AKC. They are among the most intelligent dogs out of all breeds. When a German Shepherd is focused on a task there is almost nothing that can get in its way. These dogs are such good service dogs that they are used as police dogs, guide dogs, search and rescue and much more. German Shepherds are very devoted and faithful. They will protect their families with everything they have. Due to their high intelligence they are one of the easiest dogs to train. They catch on fast and are eager to please their master. They can be quite domineering and serious, so it's recommended that the owner have previous dog ownership experience to make the transition easier. The German Shepherd does well with children, as long as you keep the size of the dog versus the child in mind. All dogs like to jump around or run by and possibly knock over objects or small children, so keep safety in mind. German Shepherds are very wary of other dogs, so use caution when placing them together. They are known to do well with other pets, but its always a good idea to have them near other animals as early in their life as possible as it will help later on. German Shepherds need a fairly routine exercise schedule. They need daily physical and mental challenges to be at their best. They enjoy exercising and doing tasks that involve learning and decision making. A good walk or run daily should be perfect for keeping them in top health. These dogs are pretty heavy shedder's and will need their coats brushed once or twice a week. They would probably not be the ideal choice of dogs for someone that is allergic to danger or has allergy issues. There are several health concerns that you should be aware of when owning a German Shepherd Dog. The major concerns are CHD and elbow dysplasia. The minor concerns include: Panosteitis, vWD, degenerative myelopathy, cauda equina, hot spots, skin allergies, malignant neoplasms, pannus, cataract, gastric torsion, perianal fistulas, cardimyopathy and hemangiosarcoma. Occasionally seen are: pancreatic insufficiency. 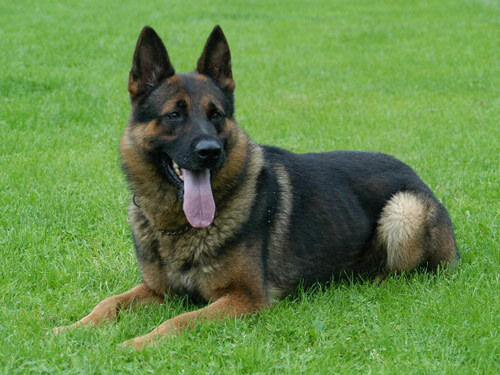 Suggested tests are hip, elbow and eye (blood).The average life expectancy for a German Shepherd Dog is 10-12 years. The German Shepherd is a recently developed breed. It was first developed around 1899 in Germany. Never before has such an effort gone into creating an improved dog. Breeders wanted to develop a breed that was good at herding and also excel at tasks that required courage, intelligence and athleticism. Many people thought the German Shepherd was related closely to the wolf since it slightly resembles one. The truth is that its a more recently developed breed and is not related closer to a wolf then any other breed of dog. It was at one time called the Alsatian Wolfdog, but this caused many people to fear the dog, so the name was dropped. German Shepherds excelled at being police dogs and in World War I they servered as war sentries. It's proven capable as a police dog, guard dog, narcotics or explosive detecting dog, search and rescue dog, war dog and shepherd.